Nice bar! I saw one somewhat similar just the other day, in the basement of a house in Portland OR. (Unsure of the age, but it was the owner's grandparents' house before she inherited it.) While this was a house party, the hosts didn't invite us to 'belly up to' it. :) Bars like this were functional yet more of a project / conversation piece for the man of the house, and like the rest of the den was his "space". My family worked the other way around: we had a wetbar which was sort of a closet, and it was well stocked and used almost daily, but there was no glorification of the space. No 'bar' to sit at/around. Although that isn't our bar, it sure is close! 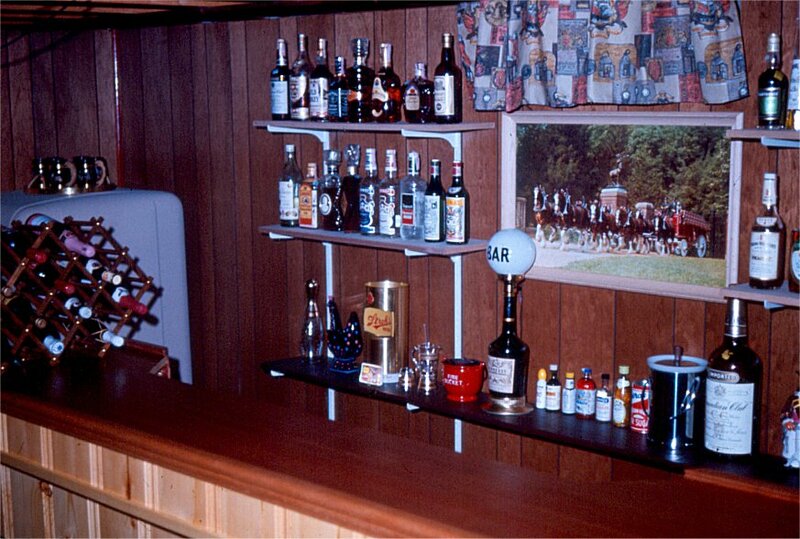 I remember (in 1968) my parents renovated the basement, covering the walls with paneling and building a bar. We had the chrome and red bar stools, too. After a day of drinking beer on the boat near Lake Michigan, the friends would gather in our bar for the evening. That bar is actually very well stocked! Hope they invite me over sometime . . .